I love a good crispy fried burrito or is that a chimichanga? I don’t know but I love them, that crispy flaky flour shell gets me every time. Except where can you buy them anymore? I don’t know and now it doesn’t even matter because I’ve mastered the art of making Crispy Baked Burritos at home. Baked Burritos to the rescue! Of course I am not whipping out the deep fat fryer or the dutch oven to fry them. I hate the smell that lingers after frying. 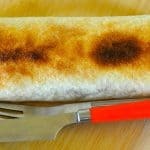 I’m baking up these crispy flaky burritos and every one in my house cheers when they see me rolling burritos for dinner. Serve them with a little fresh salad and salsa and dinner is complete. 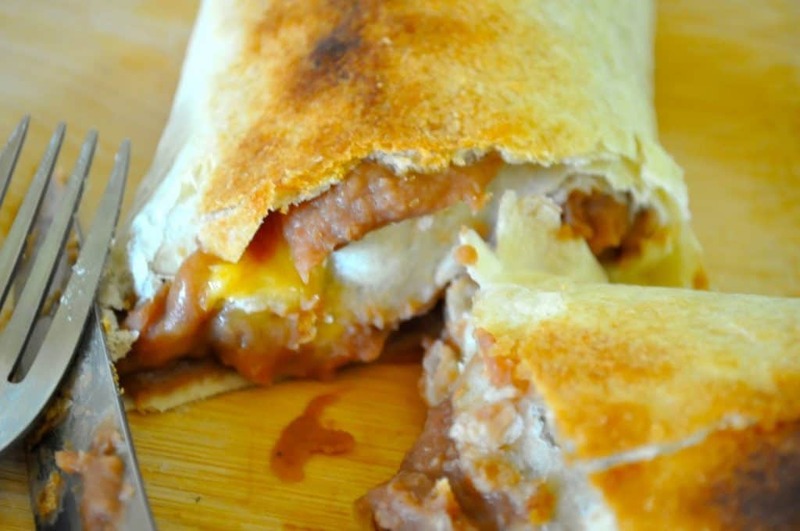 These crispy burritos are the perfect quick lunch or dinner. And they’re vegetarian too! How can they get any better? Oh yeah they’re easy on the pocket book! I love a good crispy fried burrito or is that a chimichanga? I don't know but I love them, that crispy flaky flour shell gets me every time. Except where can you buy them anymore? Doesn't matter now that I can make these Crispy Baked Burritos at home. Putting them in the lower part of the oven is essentially baking them and then when the broiler cycles on it will make the tops crispy brown. Be careful if you put them too near the element they will burn pretty quick. And then you'll be sad after making such a quick delicious dinner. If you like it, pin it?!? Great idea, I hate the greasy after smell too. Love this! I will totally need to make these 🙂 PINNED!